I'm having some trouble with the new version and line breaks in imports. When the text below is pasted in Tinderbox, the text after line break is not recognized as part of $Text. If there are more rows/notes, these don't get imported at all. The import works in Tinderbox 5, so I guess something has changed? Any solution? Name "Note text before line break. Note text after line break." Could you clarify your context? We may each only use one or two input methods but in aggregate there are many options. Yes, it is line breaks inside tab-delimited tabular data. Copying from my post strips the tabs it seems. To see the behavior, replace the spaces between Name and Text with tabs. But that screenshot doesn't show the imported spreadsheet? I want to import each row to individual notes with attributes specified by the first line. 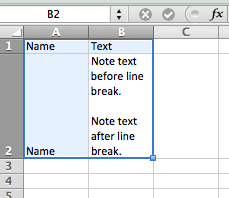 When I paste, the note is imported in a container "imported spreadsheet". Drop a tab-delim file onto a main view. Paste tab-delim data from anywhere(?) into a main view. I'm trying to check your scenario as described but it keeps being subtly redefined! Sorry. I'm using a slightly modified version of the script in link below to paste data from DEVONthink. It worked perfectly in Tinderbox 5. Could you paste a URL to a (failing) example text file of data so i can try it here. Given the above tests I suspect there are other characters - possible non-priting/invisible in your source text that may be creating issues. This text imported from devonthink using the script above imports to one note withText "More text." and an other note with name "Extra more text.". OK, I now see where the issue is occurring. I've passed in a report. I believe the v6 behaviour is not correct - it should work as in v5.